Our branding practice has been enthusiastic proponents of “driving to WHY” and “shared value” between brands and consumers. A textbook example of the power of these concepts is playing out at this moment in Philadelphia as the city celebrates its Eagles’ Super Bowl victory. The fans could have simply worn green, chanted E-A-G-L-E-S and belted out “Fly Eagles Fly.” That was expected. The Eagles could have simply gone into its divisional playoff games and the Super Bowl flexing their muscles and trash-talking their adversaries. They could have rallied around words like “destiny” and “revenge” — or focused negative energy on the Evil Empire of Tom Brady and Bill Belichek. We could have seen a David vs. Goliath scenario in the sports championship. It’s the cliché. This time, though, the storyline took a turn. After the Eagles beat the Atlanta Falcons in the Divisional Round, offensive tackle Lane Johnson and defensive end Chris Long walked off Lincoln Financial Field wearing dog masks. The masks were a defiant response to the fact that oddsmakers had made the No. 1 seed Eagles a betting underdog (and would continue to do so against the Vikings and Patriots). Little did they know that by declaring themselves “underdogs” the Eagles had achieved pure branding genius. The team rallied around the collective chip on its shoulder and the disrespect it was being handed from the press and pundits. Even former Eagles rallied to the underdog flag. For Philadelphians, the shared value was instantaneous and deep. Beyond its legacy of losing — mediocre seasons punctuated with oh-so-close victories snatched away in the final seconds of games — Philly has always lived in the shadow of New York City. Its identity as a down-on-its-luck, blue collar underdog has been imprinted on its DNA for generations. This underdog brand resonated and united the city with its team at the deepest level of human emotion. 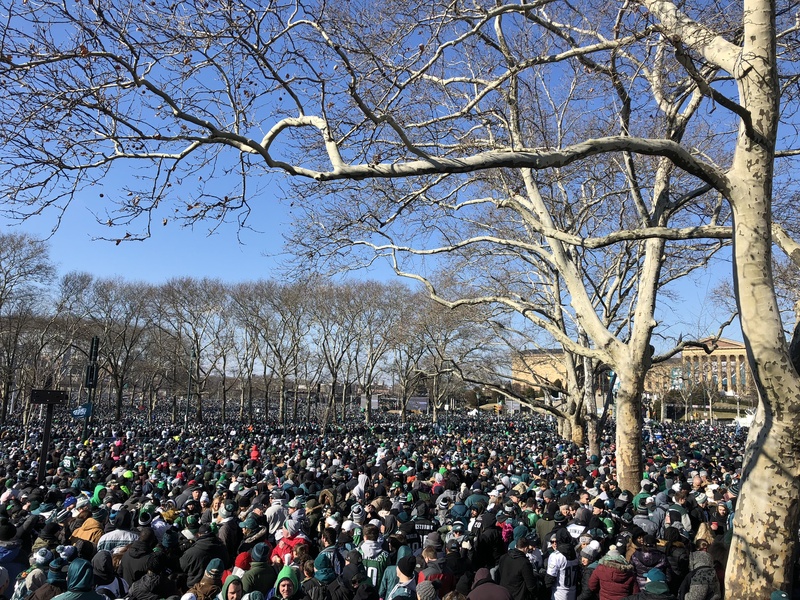 Today, millions of people assembled for the Eagles victory parade — the city’s victory parade. Sure, they were celebrating their team, but this Super Bowl victory was about so much more than football. We watched millions of Philadelphians not merely spectating but participating in their personal Rocky story. Children, parents and grandparents came together, some remembering their ancestors who didn’t live to see this day. Strangers danced, hugged and kissed. The reactions were real. The hearts were open. The tears of joy were as real as it gets. For today, the underdogs are the top dogs. The power of shared value is being seen, heard and felt around the world.